Hello sweet sketch friends! Saturday means it's time for a new sketch at The Sweet Stop. It really IS too early for Christmas, but not to early to begin working on those Christmas cards. I took the opportunity with this week's sketch to do just that! 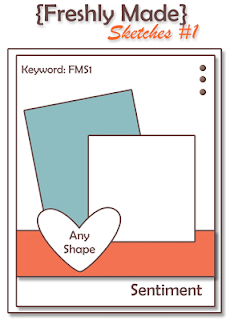 Creative Nugget: The sketch was used to create the layers for the card front using Solar Crest, Riding Hood Red, Kraft, and Aspen Frost DP by Basic Grey. The ornament, which is a sneak peek at a new stamp set being released next Friday by Sweet 'n Sassy Stamps, was cut with a matching die and stamped with Teal Zeal ink. 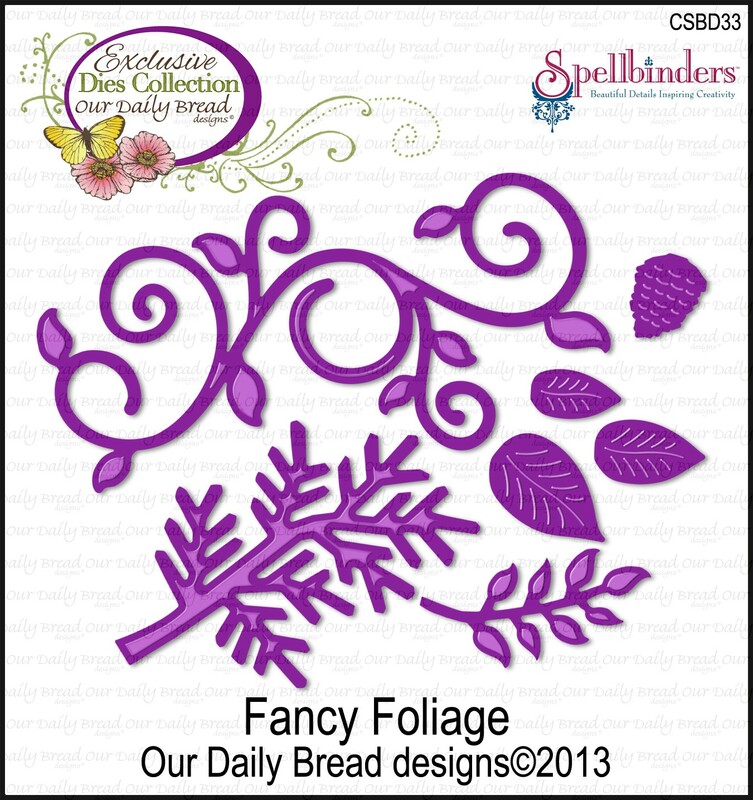 Some greenery from the Fancy Foliage Dies, a Spellbinders set made for Our Daily Bread Designs, was added at the top and the ornament was hung with some silk ribbon. A few rhinestones were added for a bit of bling. I couldn't decide where to put the sentiment so it will be added later! Be sure to check out the other Sugar Babies for more inspiration for our new sketch. 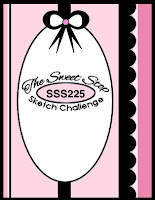 I hope you'll be able to play along with us this week at The Sweet Stop for SSS226! We love to see your creations! Thanks for stopping by...enjoy this last day of August and have a wonderful Labor Day weekend! Hello again, friends! I just love a good sketch challenge...half of your planning is already done for you and it's a great source of inspiration. 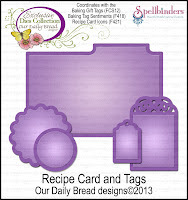 This week Our Daily Bread Designs has a fabulous Shining the Light sketch challenge, so I decided to play along! 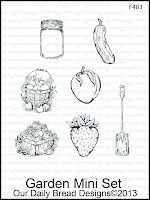 Creative Nugget: I have been enjoying the new garden stamp sets released by ODBD this month. For this card, the fruit baskets from the Garden Mini set were colored with Copic Markers, cut with a Classic Circle Nestie, and mounted on a Smokey Shadow Scalloped Circle after the piercing was done. For the background, several of the Fancy Foliage flourishes were mounted to a Solar Crest panel and embedded with a Canvas Impression Plate...love this technique. The Mint Julep DP by Webster's Pages was stitched to Smokey Shadow following the sketch. Some seam binding was tied around the card front and some Fancy Foliage vines were added as accents. 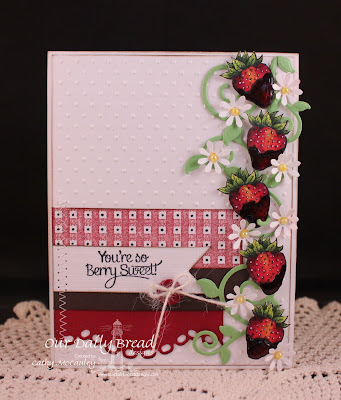 The sentiment is from the Strawberries stamp set and was stamped directly on the DP. I hope this card will be an encouragement to just the right person! Hello friends! What a gorgeous day we had today...the weather was perfect! I was able to enjoy breakfast this morning with all the retired teachers from my school district as the school buses rolled by, Kody and I went for a nice long walk, and I managed to get some stamping done...Aaaahhhh! Creative Nugget: The Basic Grey papers were stitched to True Black and mounted to a Vintage Cream card base. 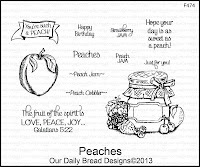 The peach jam, fruit, and sentiment are from a new stamp set by Our Daily Bread Designs called Peaches. The sentiment was stamped on DP and cut with a tag die from the Recipe Card & Tags Dies. 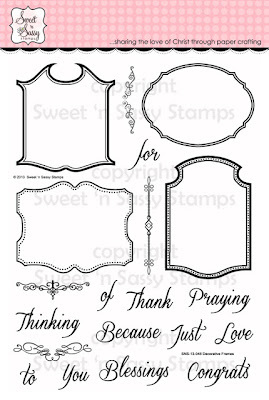 The black border is from the Antique Labels & Border Die set also by ODBD. Copic Markers were used to color the image which was cut with a Spellbinders Label One Die. Happy Saturday, everyone! 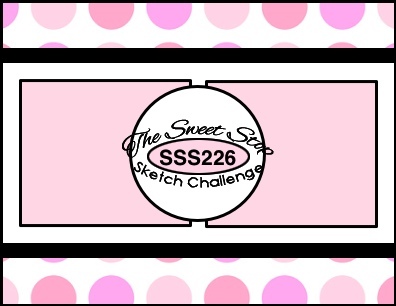 Hope you've been having a wonderful week...it's time for another new sketch at The Sweet Stop! This past Thursday, Sabrina challenged us to use beads on our card or project for the Ways to Use It Challenge on Splitcoaststampers. I did not complete my card on Thursday, but that challenge gave me the idea to use beads on my sketch sample for this week! Creative Nugget: So Saffron, Chocolate Chip and Mint Julep patterned papers by Basic Grey were used to make the panels for the layout. The So Saffron layer was embossed with a Sizzix embossing folder and stitched to the green DP layer. The patterned DP layer was stitched to a Chocolate Chip card stock panel punched with a scalloped edge. 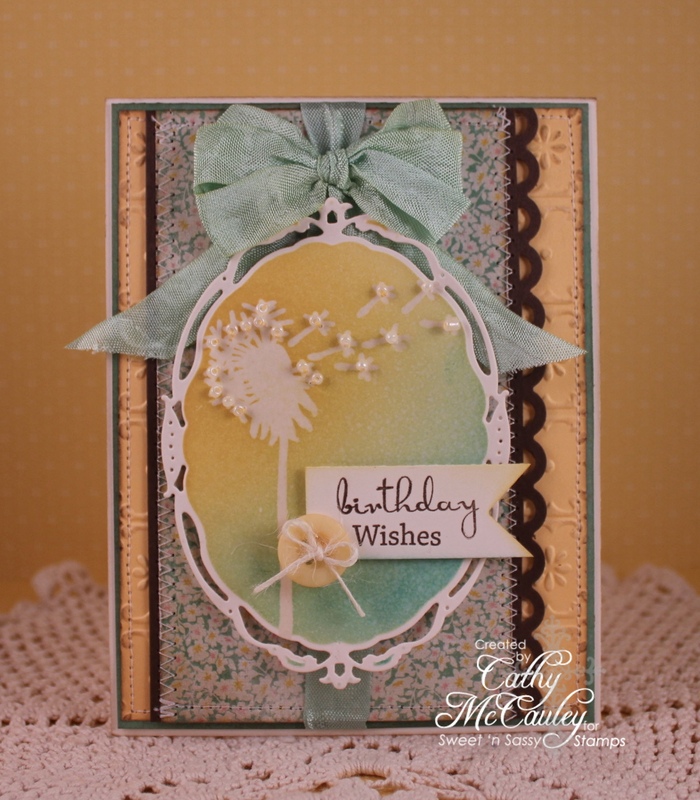 A bow made with seam binding was tied around the card front before attaching it to a Vintage Cream card base. 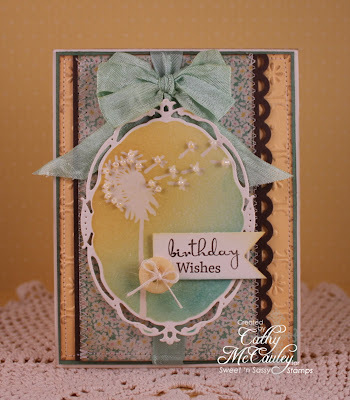 The dandelion from the Make a Wish stamp set by Sweet 'n Sassy Stamps was stamped in VersaMark and clear embossed on a piece of Vintage Cream card stock. This was cut with an Opulent Oval die and sponged with Scattered Straw and Pine Needles ink while still in the die. The ink was wiped off the image with a paper towel. Little seed beads were hand stitched to the dandelion seeds. The sentiment from the Script Birthdays stamp set was stamped on a hand cut banner and attached along with a button to the front of the card. I like the way the seed beads look on this card and will need to remember to use beads again on future projects! The Sugar Babies have some fabulous samples for you. Be sure to check them out and join us this week at The Sweet Stop for SSS225! Thanks so much for stopping by...enjoy the rest of your weekend! Creative Nugget: The Solar Crest panel was embossed with Swiss Dots and the banners at the bottom were made with Gingham stamped, Early Espresso, and Cherry Cobbler card stocks. The delicious strawberries, from ODBD's newly released stamp set Garden Mini, were colored with Copic Markers and the tips covered with Glossy Accents. 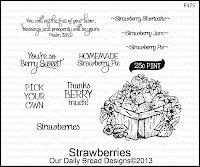 A Fancy Foliage Die, also by ODBD, was cut and placed around the strawberries. Flowers were punched and pearls added to the centers. The sentiment is from the Strawberries stamp set and this panel was hand cut into a banner. Some stitching down the side of the banners completes the card. Doesn't this just make you hungry for some chocolate covered strawberries? Thanks for stopping by! Hope you have a berry sweet day! Hello sketch lovin' friends! I hope you've had a wonderful week. The weather here has been absolutely delightful...sunny and no humidity...makes me happy! 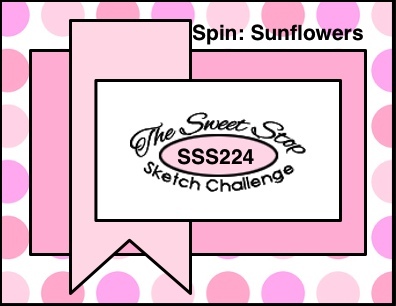 Sunflowers also make me happy, and it just so happens that our spin for this week's sketch at The Sweet Stop is SUNFLOWERS. 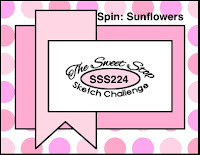 Since it's the third week of the month, if you include a sunflower on your sketch card or project, you will be eligible to win a $15 gift certificate to the Sweet 'n Sassy Store! Creative Nugget: The layers of the sketch were made with some French Collection DP by Graphic 45 (*LOVE*), old retired SU! DP, Riding Hood Red, So Saffron, and Early Espresso card stocks, a little stitching, and some embossing. 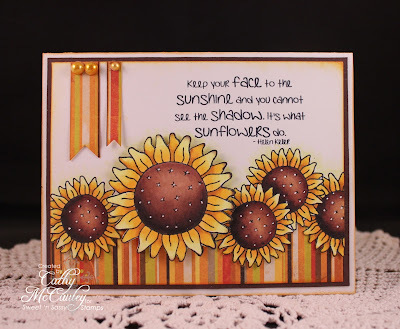 The sunflowers, from the newly released Prim Blessings stamp set, were stamped, masked, and colored with Copic Markers on a Vintage Cream panel. An extra sunflower was colored and cut to pop up on the middle sunflower. The Fence Die was cut from Riding Hood Red and added to the bottom of the panel along with a little greeting from the Mini Tags & Sentiments stamp set cut with a Mini Tag Die and some colored rhinestones. Now doesn't this card make you smile! For more happy cards be sure to check out the other Sugar Babies! Come join us over at The Sweet Stop this week for some sunflower fun and a chance to win a PRIZE! Thanks so much for stopping by for a visit...I always like to hear from my friends! 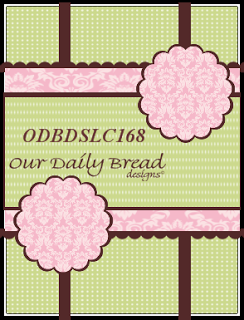 Our Daily Bread Designs August Release. 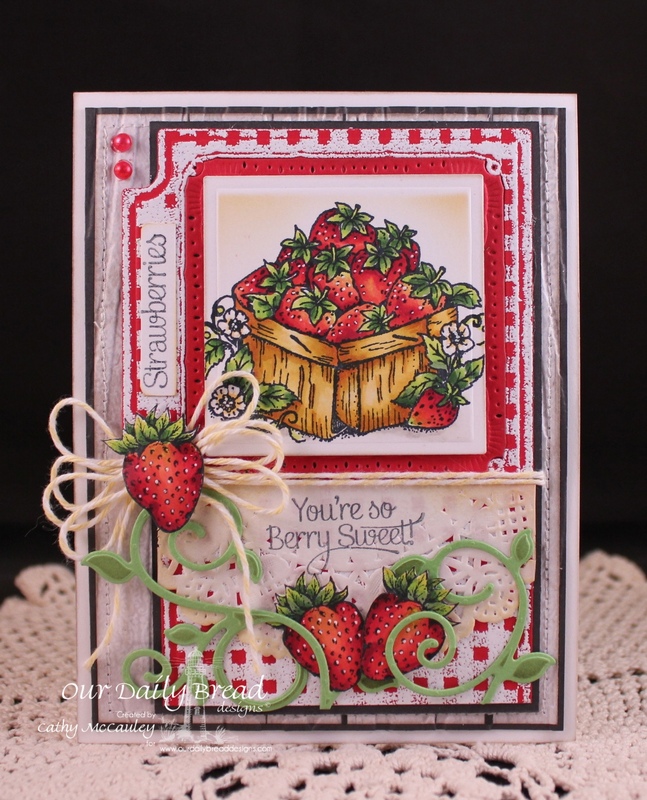 There are so many garden goodies to choose from this month, so I chose images from two of the new stamp sets for my sample...Strawberries and Garden Mini. Creative Nugget: The recipe card was cut using the Recipe and Tags Dies, a Spellbinders Marvelous Square frame was cut from the top and from a piece of Real Red card stock, and the Gingham Background was white embossed on the card. The Strawberries were stamped on a Square Nestie and colored with Copic Markers and a Signo White Gel Pen was used to highlight the seeds on the berries. 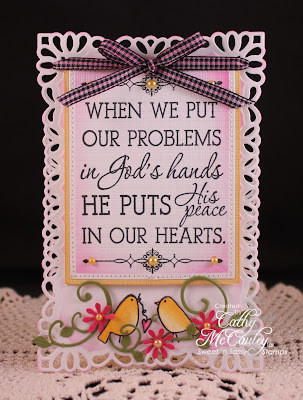 The sentiment was stamped on half of a doily and attached under the strawberry frame. The recipe card was matted with Smokey Shadow and attached to a My Mind'e Eye panel which was stitched to Smokey Shadow and mounted to a Solar Crest card base. Butter Cream Baker's Twine was tied around the recipe card and a bow attached. Some strawberries from the Garden Mini set were colored and fussy cut and added to the card along with some Fancy Foliage. A few pearls colored to match the strawberries were added in the corner to finish the card! For more amazing inspiration using the August Release, be sure to visit the ODBD Blog. My very talented Sister Sticks are linked below for your convenience. They have more garden goodies made just for you! 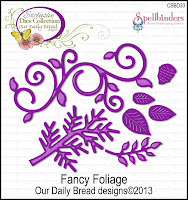 Welcome to the last day of Sweet 'n Sassy Stamps Feature Blog Hops for the month of August! 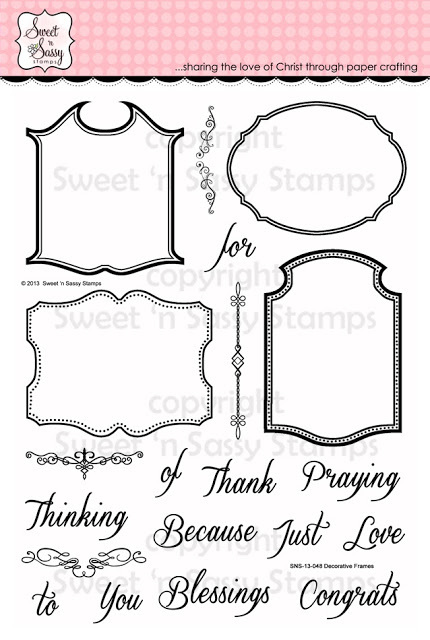 Today we're featuring two great sets in a new series of large inspirational sentiments perfect for sending encouragement to friends and family members experiencing life's trials. 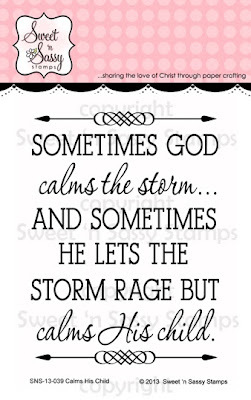 The thoughts expressed in these two stamps assure us that God is in control and He will see us safely through the storm! 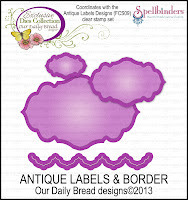 The image measures approximately 2 1/2" x 3 3/8"
Creative Nugget: It has been a long week and I found my mojo waning until I saw the Color Challenge on Splitcoaststampers yesterday. Melon Mambo, Old Olive, and Daffodil Delight are such pretty, bright colors, and hopefully they will bring cheer and encouragement to the recipient! The sentiment was stamped on Solar Crest card stock with Olympia Green Versafine ink, cut with a Rectangle Nestie, and stitched to Daffodil Delight. The card base was made from two Resplendent Rectangle Dies. One was scored 1/2" from the top and sticky tape applied above the score line. The other die was matched and adhered to make the card front. 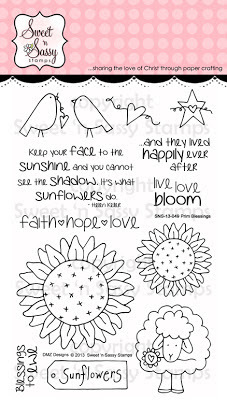 The two little birds from Prim Blessings were colored with Copic Markers, cut out, and popped up under the sentiment along with a Cheery Lynn flourish and some punched flowers. My favorite embellishment...pearls, were added to complete the card. 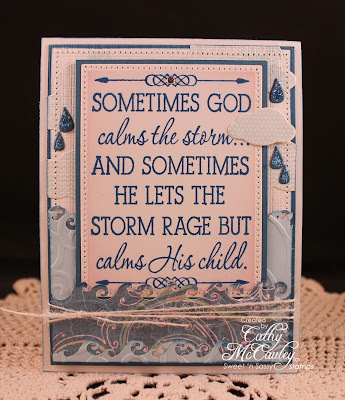 Creative Nugget: The sentiment was stamped on Vintage Cream card stock with Blue Lagoon Ink, cut with a Rectangle Nestie, and matted in Not Quite Navy. Soft Sky card stock and old DP scraps were cut with the Wave Die and run through the Big Shot with the Swirls embossing Folder by ProvoCraft to create the stormy sea. 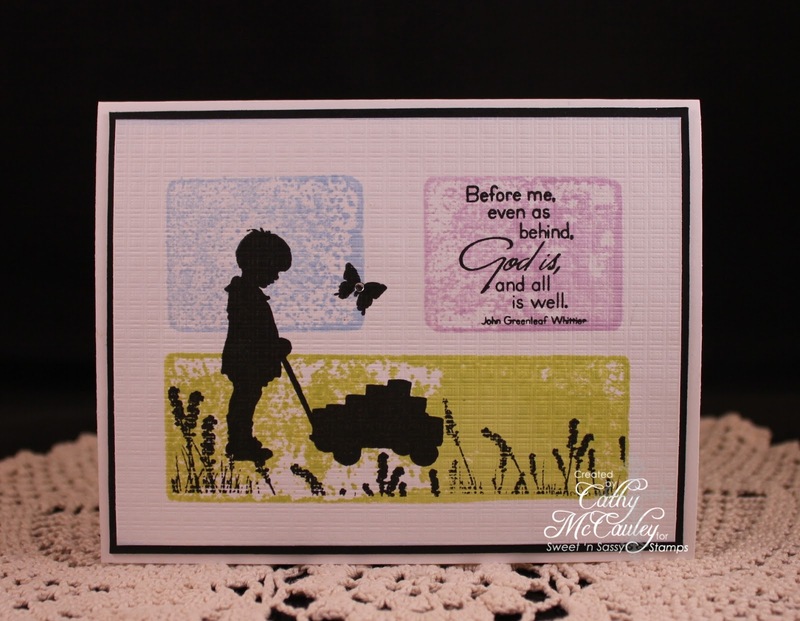 Several Cloud Dies were stamped in Soft Sky ink using the Head in the Clouds stamp set. The Raindrop Dies were given a coat of Star Dust Stickles and some twine was added to complete this monochromatic card. Be sure to leave a comment on each blog along the way because we're giving both of these sets away to one lucky winner! The deadline to comment for a chance to win is Friday, August 16th at midnight EST. The winners will be announced on our website homepage on Monday, August 19th. I hope you've enjoyed all of our featured hops! Thanks so much for stopping by...have a blessed day! 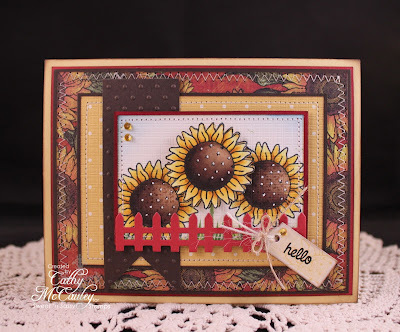 Welcome to Day 4 of Sweet 'n Sassy Stamps Feature Blog Hops for the month of August! I hope you've been inspired by the hops thus far. I just love the images we will be sharing with you today...we're featuring Dina Kowal's wonderful companion set to His Child. 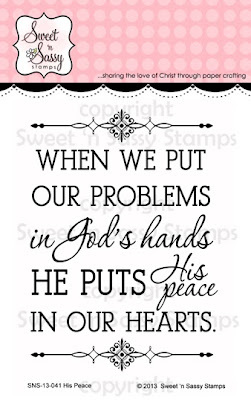 God's mercies are new every morning...He goes before us and prepares our steps! I'm so glad! 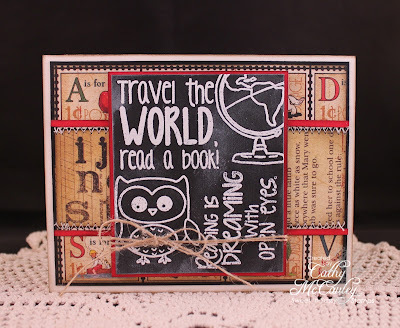 The inspiration for my sample came from this thought and the Technique Lovers Challenge yesterday at Splitcoaststampers which was to create an external frame and an internal greeting. 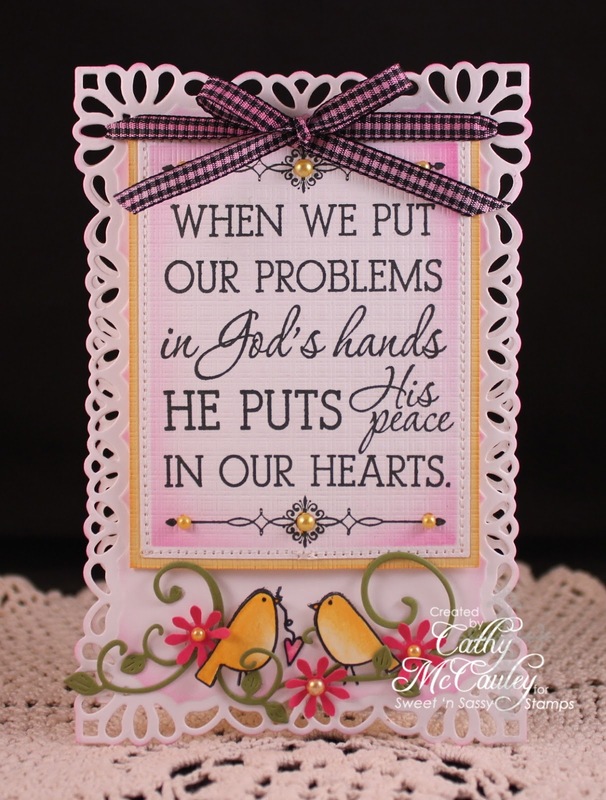 Creative Nugget: The outside of the card was made by embossing the sun rays with a Tim Holtz embossing folder by Sizzix. The rays were masked and sponged with Memento inks. 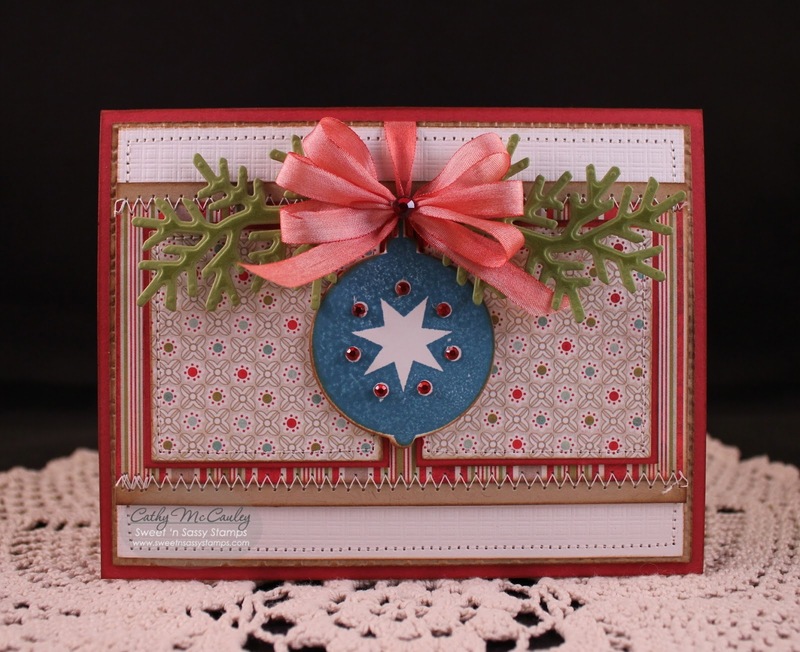 A circle frame was made with Spellbinders Circle and Scalloped Circle Nesties. This panel was stitched to a True Black mat. The gingham bow was tied through the frame before attaching the panel to a Solar Crest Card front from which a circle frame had been cut to allow the inside to peek through. The inside of the card was made by inking up several acrylic blocks with Memento inks and spritzing them with water before applying the ink to the Solar Crest panel. 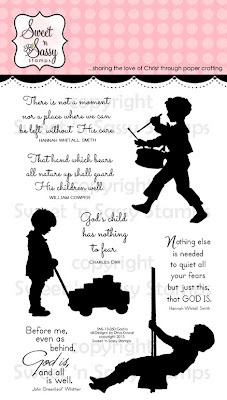 The little boy pulling the wagon and the sentiment from God Is was stamped over the color blocks with Versafine Onyx Black ink along with other silhouette images from Serene Silhouettes and Nature Silhouettes 2. This was then embossed with a Canvas Impression Plate and matted in True Black. Here is another card using the swinging boy image from God Is that was featured in a previous post. For more details about this card, click HERE. I think you'll agree...these images are just darling! Be sure to leave a comment on each blog along the way because we're giving this wonderful set away to one lucky winner! Thanks so much for stopping by! Be sure to stop back again tomorrow for the last featured hop for the August release. Enjoy the hop and have a terrific Tuesday! 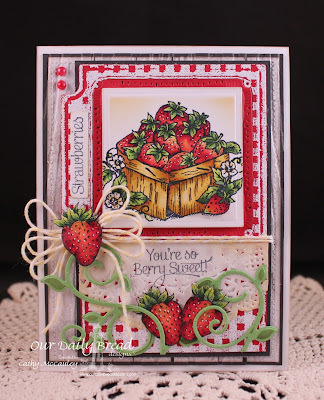 Welcome to Day 3 of Sweet 'n Sassy Stamps Feature Blog Hops for the month of August! 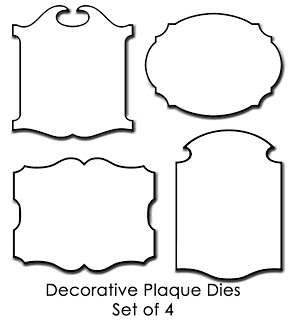 Today we're featuring a wonderful new set that coordinates with one of our existing die sets, Decorative Plaques...a perfect match! Creative Nugget: The inspiration for this card came from the Featured Stamper Challenge on Splitcoaststampers yesterday. I chose to CASE Joyce's His & Hers card, but used one of the Decorative Frames with the ewe from Prim Blessings as the main focal point. The ewe was stamped once on the frame and once on a piece of scrap Solar Crest paper. Copics were used to color both images. The head of the second image was cut out and popped up on the frame image. Some fun flock was added to the wool on the top of the head. The Fancy Pants DP panels were stitched to a True Black mat and mounted to a Solar Crest card base. Part of the sentiment from the Decorative Frames stamp set was stamped in Real Red under the ewe, and part was stamped directly on the DP in Versafine Onyx Black. 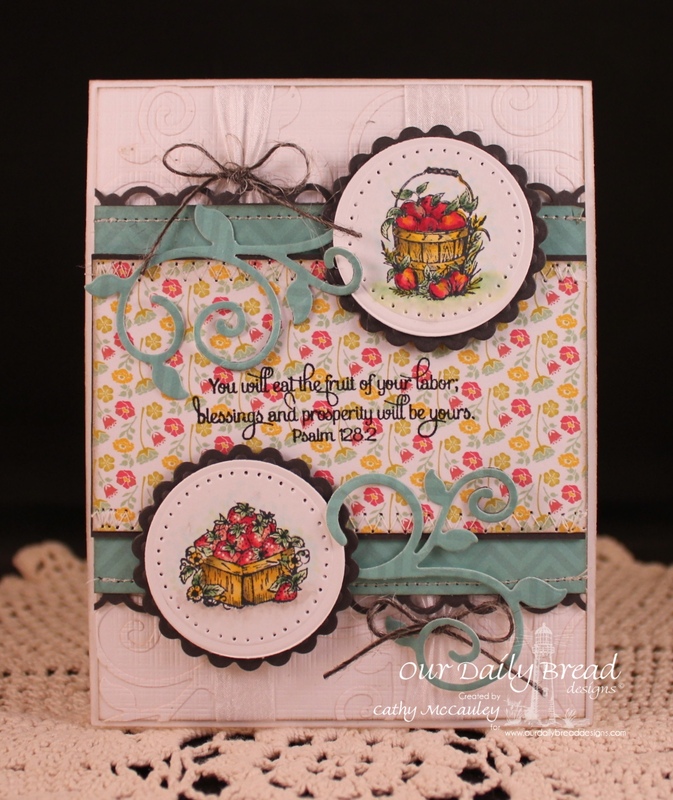 A Doily Border Die, pearls, a heart button, and some stick were added to finish the card. Creative Nugget: The background was made by using a brayer to apply So Saffron Ink to the inside front of the embossing folder before putting it through the Big Shot. This gave a subtle color to the debossed areas. A Decorative Plaque was cut with the die and stamped with the matching Decorative Frame in Smokey Shadow ink. To get the words straight, they were all placed on the block at the same time. The topper was stamped with Soft Sky ink and pearls were added. The Authentique papers were stitched to Smokey Shadow card stock and mounted to a Solar Crest card base. Embellishments were added to finish the card. I like how this one turned out and hope you do, too! Be sure to leave a comment on each blog along the way because we're giving this stamp set away to one lucky winner! The deadline to comment for a chance to win is Friday, August 16th at midnight EST. The winners will be announced on our website homepage on Monday August 19th. 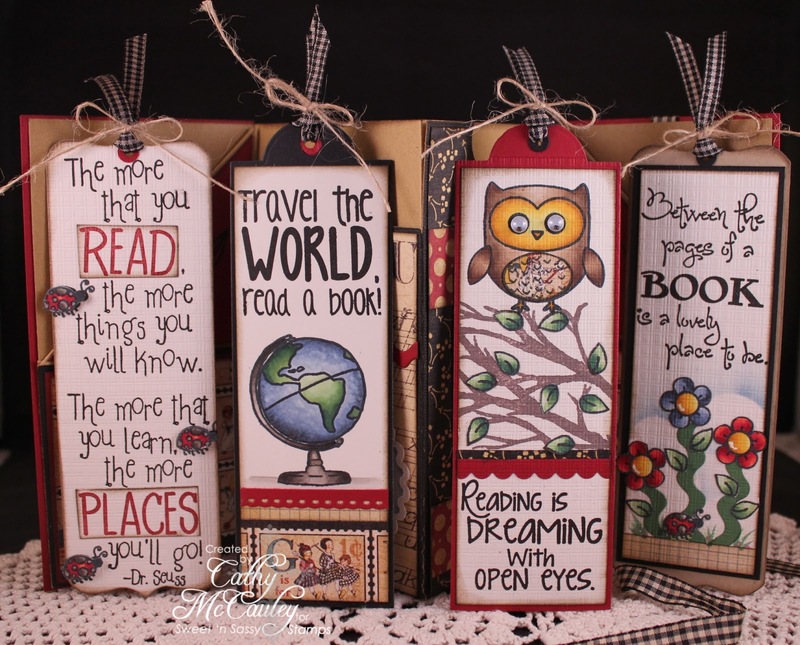 Welcome to Day 2 of Sweet 'n Sassy Stamps Feature Blog Hops for the month of August! If you love adorable primitive images, you will enjoy today's hop. This versatile set by Diane Zechman is full of prim possibilities! 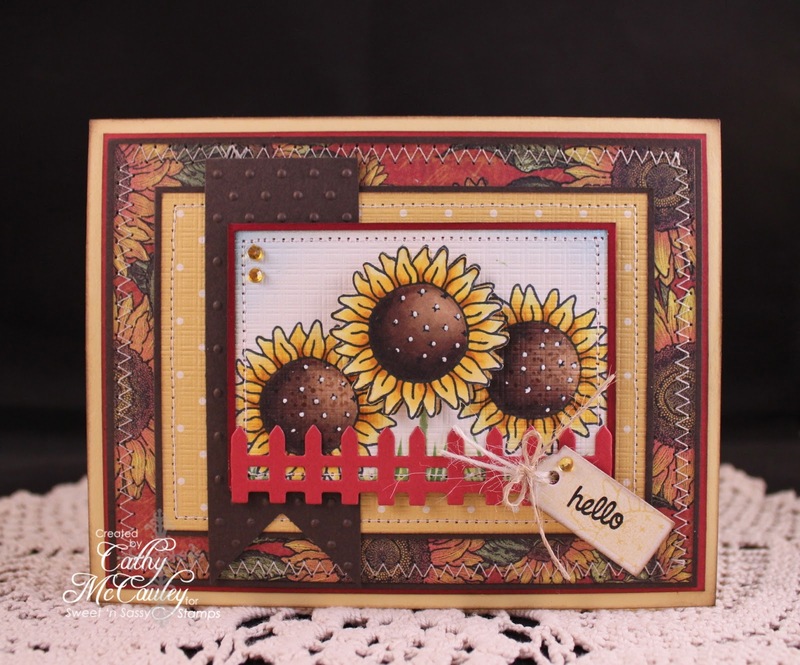 The large sunflower image measures approximately 2 1/4"
Creative Nugget: The large and small sunflowers were masked and stamped along the bottom edge of a Vintage Cream panel. Some fussy cutting was done along the bottom and the panel attached to a piece of Bo Bunny DP from the Apple Cider Collection. The sunflowers were colored with Copic Markes and a second large sunflower was colored, cut out, and popped up for dimension. The Helen Keller sentiment was added to the top of the panel along with two little fishtail banners and pearls. This was attached to a Dark Chocolate matt and mounted on a Vintage Cream card base to finish the card. Nothing like a field of sunflowers to brighten someone's day! Be sure to leave a comment on each blog along the way because we're giving this set away to one lucky winner! Thanks so much for joining us today...enjoy the hop! 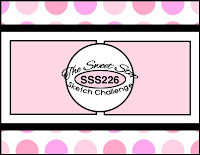 Welcome sketch lovers AND Sweet 'n Sassy Friends! 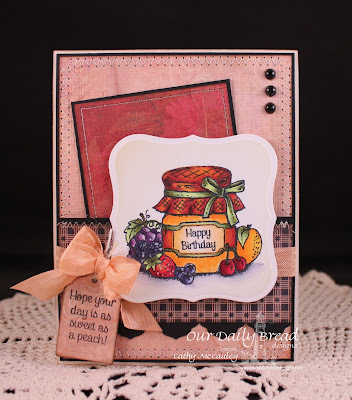 Not only do we have a wonderful new sketch at The Sweet Stop, but it is Day 1 of our Sweet 'n Sassy Stamps Release Feature Blog Hops for the month of August! The featured stamp set for today was used to make a sample for this week's Sweet Stop sketch and a fun project! The owl image measures approximately 1 3/4" x 1 5/8"
Bookmarks measure approximately 2" x 6"
Creative Nugget: Two of the sentiments and images from Bookmark Bits & Pieces were embossed in white on a True Black panel and smudged with some Wedding Dress Memento Luxe ink to create the chalkboard look. Jute was tied around the chalkboard layer. Some Graphic 45 DP was used for the other panels on the sketch. These were matted in Real Red and True Black. Stitching was added before mounting the card front to a Vintage Cream card base. Be sure to check on the other Sugar Babies for more inspiration for SSS223 at The Sweet Stop! Hope you can join us this week! Creative Nugget: I found a Large Tag Folded Book on Technique Junkie's 3D & Fun Folds Paper Craft CD and thought it would be perfect to hold several bookmarks...I was right! The book was made with Cherry Cobbler, True Black, and Core'dinations card stocks and the same Graphic 45 papers as above. 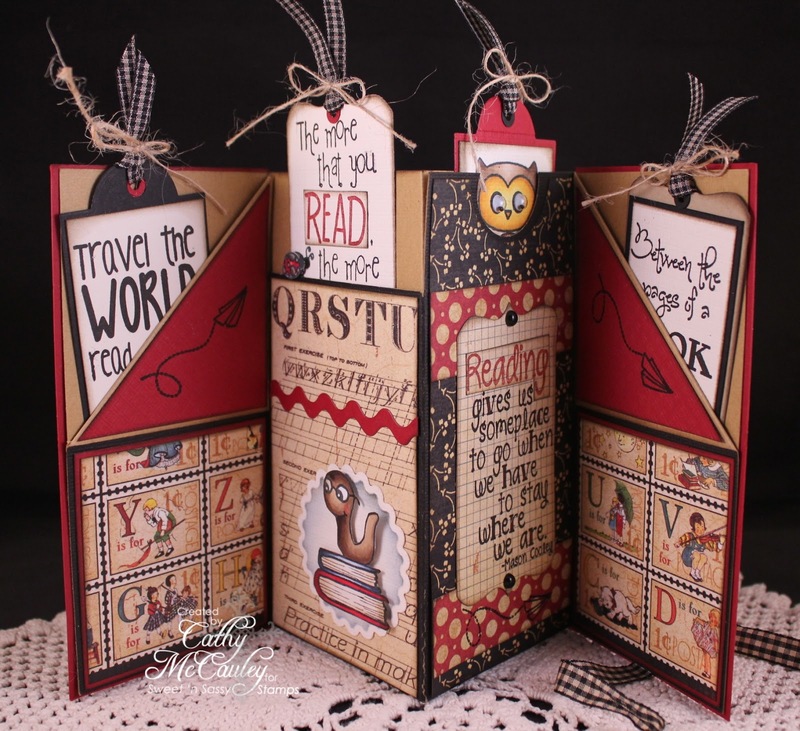 The "READ" was stamped three times in Cherry Cobbler, cut from the Dr. Seuss quote, and attached to the Label die included in the set of dies...LOVE all the bits & pieces! This is what the book looks like opened up. Each of the little pockets was perfect for holding a bookmark! The tag on the third section was actually made with one of the bookmark dies. The top part was cut first, then by lining up the panel and cutting again, a label was made to perfectly fit the quote! Here are the four bookmarks out of the pockets. The images were all colored with Copic Markers. 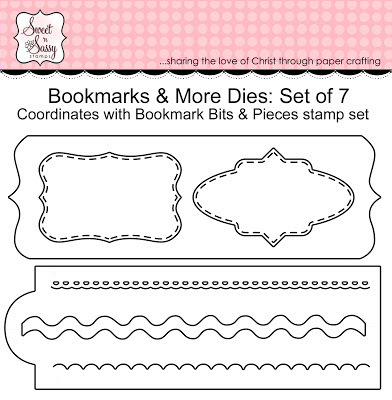 The Tree Background stamp was used on the owl bookmark and the Ric-Rac die included in the Bookmarks & More Die Set was used for the flower stems on the fourth bookmark. I wish I would have had this set of stamps and matching dies while I was still teaching first grade! Be sure to leave a comment on each blog along the way because we're giving this fabulous bundle away to one lucky winner! Thanks so much for joining me today...enjoy stopping by the Sugar Babies AND the hop! Have a wonderful day and stop back again tomorrow for Day 2 of the Feature Hops! Hello blogland friends! Hope you've had a wonderful week. After finishing up a week of vacation and a week of Vacation Bible School at our church, I'm ready to relax in my favorite crafting space! It's a Sweet Stop Sketch Saturday, so come play along! 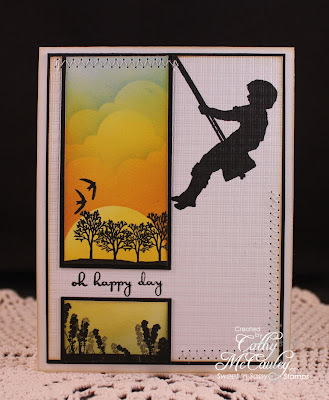 Creative Nugget: The swinging boy, from a brand new stamp set called God Is...being released this Friday at Sweet 'n Sassy Stamps, was stamped on a piece of Solar Crest card stock along with the sentiment from Long Stem Silhouettes. My favorite Canvas Impression Plate was used to give this panel some texture. The scene was sponged and stamped with other silhouettes from the popular Landscape Silhouettes, Nature Silhouettes 2, and Serene Silhouettes stamp sets. The scene was split, making room for the sentiment, and a little stitching was added before matting the panel on True Black and attaching it to a Solar Crest card base. No bling...no ribbon...just a very simple design for you today! The Sugar Babies have some more fabulous samples for your inspiration, so be sure to check them out and join us this week over at The Sweet Stop for SSS222! Thanks so much for stopping by! Have a marvelous weekend!